In addition to good conditioners and lots of patience, the best wave brushes can make getting 360 waves much easier! Finding the right one can take some trial and error, so we did some of the hard work for you. We found 10 wave brushes for a variety of hair types, budgets, and handles, so you can find the right one for your hair! Before we get into the wave brush reviews, here are a few things to know first. 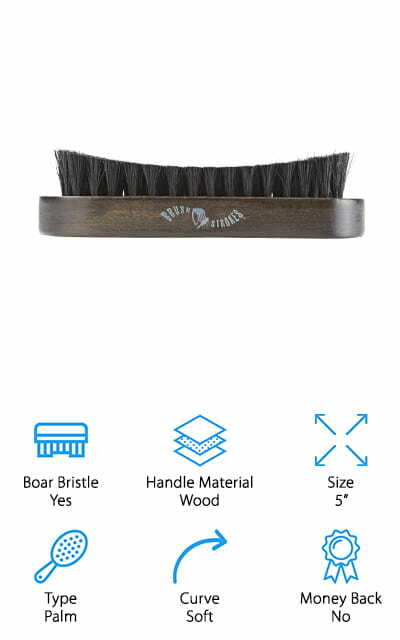 Boar Bristle: The best wave brush to use is typically made of 100% boar bristles. 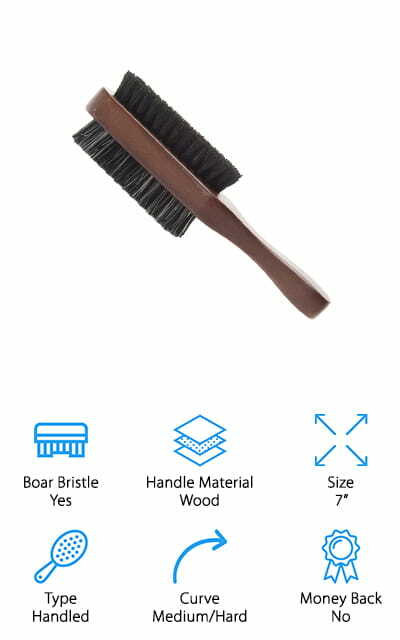 Some brushes use “filler” bristles, in addition to boar bristles, made of nylon, plastic, and other synthetic materials to cut costs or create different levels of firmness. Handle Material: The wave brush’s handle materials can affect the overall look and feel of the brush you’re using. Wood handles look old-fashioned and classic and feel comfortable in the hand. Plastic handles have a modern feel and can tolerate getting wet. Size: When we measured a handled brush, it is the handle and brush head length together. For palm brushes, we measured the length. This can help you find a brush that fits your hand, or fits your luggage when you travel! Type: We found wave brushes with handles and without handles, so you can create the perfect waves however you like! Handled brushes are great for hard to reach spots. Palm brushes give you more control, and they pack well when traveling. Curve: The curve of your wave brush is talking about the bristle firmness. Soft bristles are great for thin hair or sensitive scalps. Medium and hard bristles are great for thick, coarse hair and for creating better precision with your waves. Money Back Guarantee: Much like a warranty, a money back guarantee is nice to have in case something fails with your wave brush. It’s a good sign the company stands by their product, and they will make things right if something goes wrong! Now that you have a better idea of what type of wave brush you need, let’s get into our wave brush buying guide! Whether you want an inexpensive wave brush to get started, or you want to upgrade to a higher quality brush, we have options for everyone! If you’re short on time, that’s totally fine! We started with our Top Pick and Budget Pick, so you can read up on those and come back to read about the rest! Let’s start with our pick for the best wave brush that will give you beautiful waves in no time! The Torino Pro Wave Brush is one of the most popular wave brushes out there, and for good reason! This 100% boar bristle brush is designed specifically for getting waves out of any hair texture, from soft to coarse. The curved brush gives you more control and helps you get into tough to reach spots around your head. We like the pointed tip because it helps you get into the crown of your head more easily, which can be tough to reach with the wrong brush! The handle is made of wood, and it’s comfortable to hold for long periods of time. We also like that this brush is made to last – the bristles won’t bend or shed, even after lots of brushing! We think this is a great investment in your hair care to keep your waves in great shape! Our Budget Pick is a cheap wave brush that we think is both a great value and also great for beginners! This two-sided brush has medium bristles on one side, and firm bristles on the other. We like this because it gives you the option to use a different firmness on different parts of your head, or give your scalp a break on days you don’t need a firm brush. The wood handle is comfortable to hold, and it will look beautiful on your bathroom counter. The bristles are implanted into the wood properly to prevent breakage or shedding over time, so you’ll have to replace brushes less often. We think this is the best 360 wave brush for beginners who want to practice getting waves on their own since you only have to buy one brush to start! We think this would be a great gift for a young man who is starting to care for his own hair! If you prefer your wave brush with a handle, but don’t want t spend a lot, consider picking up one of these wave brushes from Wav Enforcer. This inexpensive brush is great for adding waves to short or medium-length haircuts, and for maintaining your current wave pattern. We like that the brush head is nice and big, allowing you to grip more hair with each pass to reduce the amount of time you spend brushing your hair. 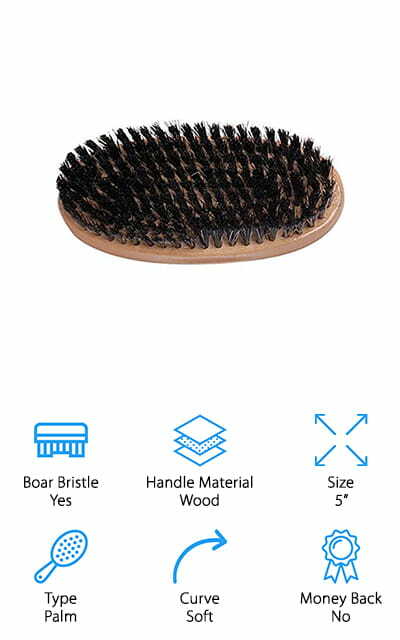 The medium boar bristles were designed especially for using on thick hair to help distribute conditioners and natural oils from your scalp to keep your hair healthy and shiny. We like the wooden handle, which is comfortable to hold and easy to handle while moving the brush around your head. This is a nice brush to train your coarse or unruly hair into beautiful waves, and it’s comfortable enough to use every day to maintain your wave without irritating your scalp too much. If a medium or hard bristle wave brush is too harsh for you, no worries! This soft bristle brush from Magic Collection will give you waves without any added irritation! 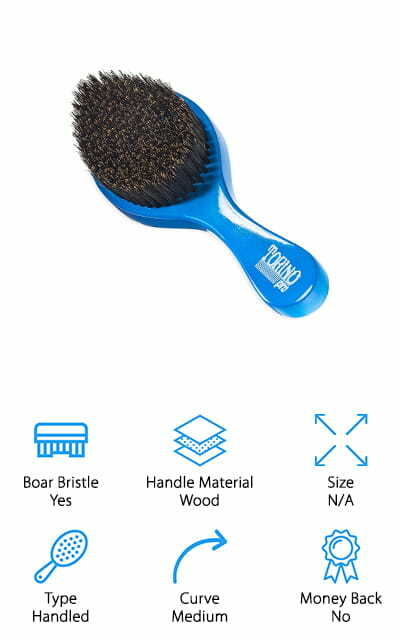 The palm-sized brush is made of wood and 100% boar hair, yet it won’t break your budget! We like that the soft bristles gently coax thin or slightly straight hair into beautiful waves. It’s also a great brush if you have a sensitive scalp because it won’t pull the hair too hard to scrape the scalp too much. The bristles are perfect for gently exfoliating your scalp to remove excess skin and oil, and for distributing hair oils throughout the hair to keep them healthy. In addition to using on your head, this is also a great brush to use on your beard, especially if you have sensitive skin! These brushes are fairly inexpensive, so you can pick up a couple to keep at home and in your travel kit! As you get older, and your hair naturally starts thinning, it is a good idea to toss out your hard wave brushes and invest in some quality soft brushes. The #710 brush from Torino Pro is perfect for thinning hair and sensitive scalps. 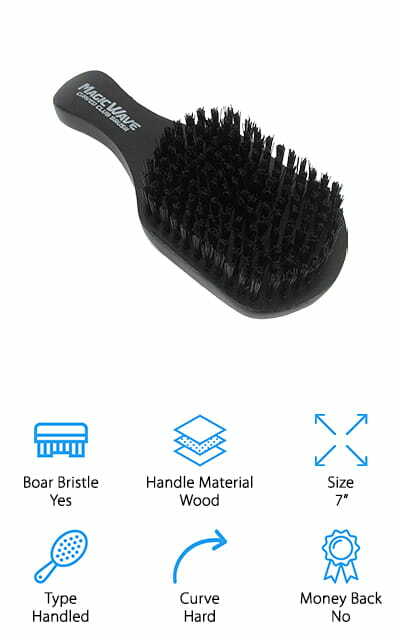 This brush is a mix of medium and soft boar hair bristles, giving you the control you need to create waves and keep them looking nice. The softer bristles are made for thinning hair because they don’t pull on the hair too hard, which can cause more severe thinning or bald spots. The comfortable, curved handle is made of wood and is designed to cover large areas and get into hard to reach places like the crown or around your ears. Even if you don’t have thinning hair, this is a great brush to pick up for brushing your hair back into neat waves after a fresh cut, or for re-training your waves during a wolfing period! Whether you are a die-hard 360 waver, or you just want to give your scalp a healthy massage, this wave brush from Annie Professional is the best wave brush for coarse hair! This brush uses medium bristles that are great for all kinds of hair types, from super coarse to average thickness. It stimulates the scalp, which helps it shed excess skin and oil to keep your scalp healthy. By distributing the oils from your scalp to your hair, this brush also helps your hair stay moisturized and shiny on its own, which means you don’t have to use harmful soaps or pomades every day. We like that the handle is nice and long, giving you plenty of control while brushing all over your scalp and into tough areas like around your ears. It works great to train new waves, maintain your current ones, and give your scalp a massage during wolfing sessions – even if you have super thick hair! Another great palm wave brush for both your massaging both your head and beard comes to us from the company Brush Strokes! 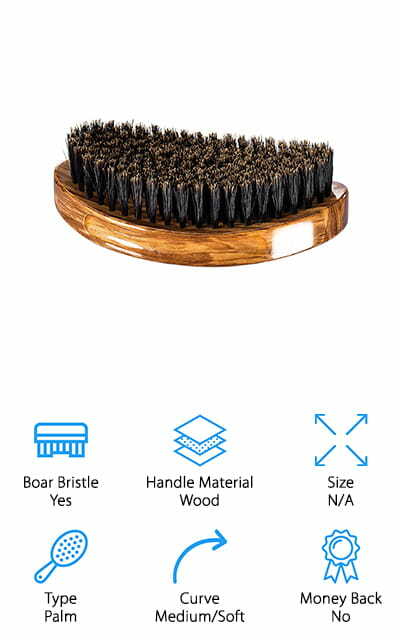 This military-style wave brush has soft boar bristles that are great for creating waves on thinning hair or sensitive scalps or using at the end of your styling routine to give your waves some extra polish. It’s also a great brush to use with your beard, shaping and conditioning it as you lightly brush through it daily! We like that the bristles are trimmed to a sharp curve, so it will work into the scalp easily, no matter what shape head you have! The handle is another great feature, made of wood and sized perfectly to fit comfortably in yours. 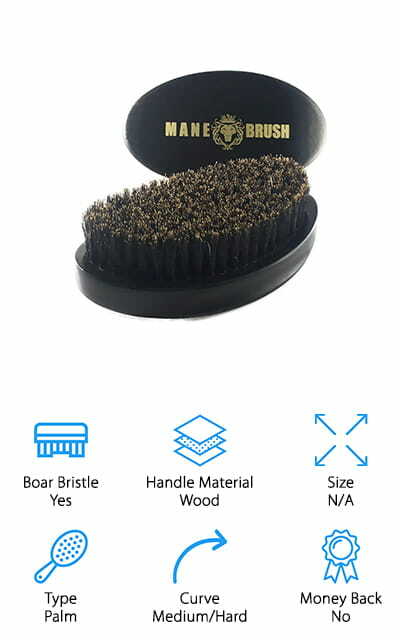 Even women and men with smaller hands can easily manage with this brush! The size is also great for throwing into your handbag, or packing it in your travel kit before heading out on your next big vacation! Last up is one of our favorites if you need a hard bristle wave brush to add to your daily wave routine. Using hard bristles is great for training your hair into a new wave pattern, or for returning your hair to 360 waves after a wolfing period. It’s perfect for using on thick and coarse hair, and easy for both beginners and seasoned wavers alike! We like that the 7-inch handle is small and easy to grip, giving you the control you need to get your waves in order quickly. We also really like that the handle is short, so you can use this by gripping the handle, or switch it up and use it as a palm brush! This is great, especially if you spend a lot of time brushing your hair, to prevent fatigue! It’s also a great brush for beginners because they can get used to using it both ways and find what works for them! Investing in the best hard wave brush not only helps your waves form perfectly, but it also helps to keep your hair and scalp healthy. This palm wave brush from Mane Brush is perfect for men and women looking to upgrade to a higher-quality brush to add to their collection. 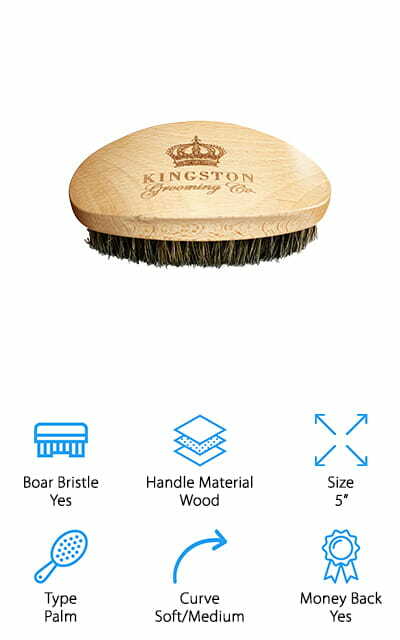 This palm-sized brush is made of 100% boar bristles, and the handle is a beautifully stained maple wood that looks luxurious and sturdy. We like that the curved handle has grooves on the side for better gripping, which is nice if you have small hands or trouble gripping a brush for long periods of time. The medium/firm bristles are designed to stay in the brush without bending or falling out, even after lots of daily brushing. This brush will work best in thick or coarse hair and makes a great brush to train new waves or maintain your current ones with daily brushing. It would make a great gift, too! Next up is a professional-grade handheld boar bristle wave brush we think would make a great addition to your daily hair and beard care routine! Kingston makes professional-quality wave brushes that are made to last and look beautiful sitting on your bathroom counter or bedside table. The handle is made of gorgeous beech wood, and its curved design makes it easy and comfortable to hold in your hand. This is a great brush to use for maintaining your waves, but it’s also just as good for using on beards, too! You can use the soft/medium bristles to add waves to soft or thin hair on your head, or distribute oils and soften your beard. The brush comes with a beautiful box you can easily keep on your countertop, or toss into your luggage before your next trip! If you prefer handheld brushes for your hair or beard maintenance, definitely pick one of these up to add to your daily routine!